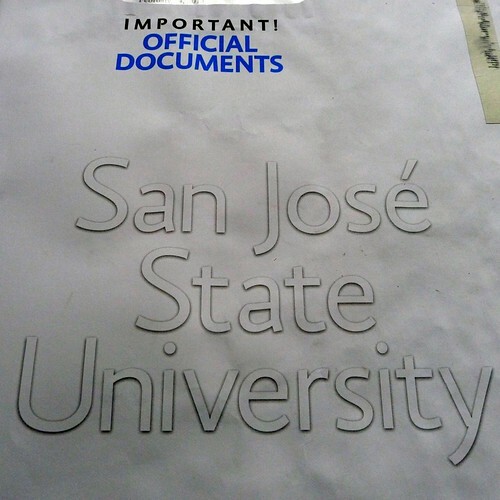 Paul was Admitted to SJSU! My son Paul was just admitted to San Jose State University (California’s first public institution of higher learning – founded in 1857). He will be studying Art and Studio Practice for a SJSU Bachelor of Arts degree. Paul will graduate with his Associate of Arts degree in Studio Art from Foothill College in June 2014 and start at SJSU in September. We are so proud of him! You can see Paul’s art portfolio on his website: Paul’s Element. 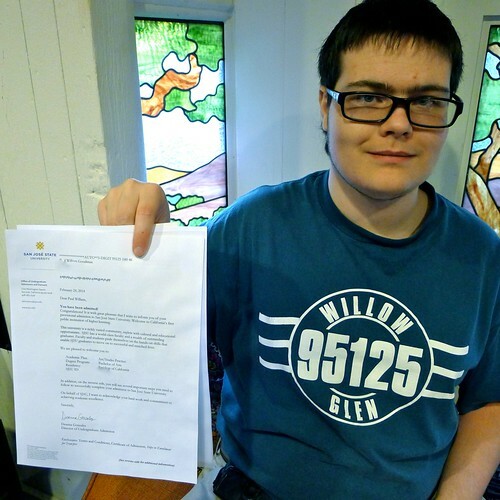 I am particularly happy that Paul got his acceptance package after reading yesterday’s sad article “Students With Disabilities Aim For A College Degree, But Often Get Stuck” (by Joy Resmovits in The Huffington Post). In my last blog entry about Paul’s progress, I presented some of our challenges with the educational system. Paul’s hard work and dedication have now paid off. Hooray! Delighted with the good news for Paul.